Now soy-free! Spice up your baked potato, Mexican dishes, dips, or use as a replacement in any recipe. This dairy-free sour cream is 70% organic, and tastes as good as any non-vegan version we had eaten in years past. It’s so amazing, if you didn’t know it was dairy-free you’d swear it wasn’t vegan! 16 oz. (453g) container is $7.49. 1. A single cold shipper box + cold packs will add to your order automatically when the first cold product is added to the cart. You only need this one cold shipper on your order (we will add an extra cold shipper only if absolutely necessary), so please do not add additional units. If you choose to delete this cold shipper, you are assuming all risk with your order and items may not arrive in ideal condition, so do not remove this unless you are 100% accepting all responsibility for however the items arrive, as no replacements or refunds will be given on orders containing cold goods where the shipper has been removed. 2. As this product is a cold item, we can only recommend shipping with a service that shows a delivery of either 1 or 2 days in transit to ensure proper freshness on arrival (shipping times for each service are shown at checkout). If Ground services show 3 days or longer for delivery time estimates at checkout, you accept all risk in selecting any service that shows more than 1 or 2 days for estimated time in transit as we cannot replace or refund on cold items that take beyond 2 days to arrive once shipped if they arrive completely thawed and warm. Please select 2nd Day Air or Next Day Air if Ground services do not show delivery within the 2 day time range to ensure best condition of items on delivery. 3. Orders containing cold items will only ship during the week ordered so long as they will arrive before Saturday to ensure proper condition on delivery (UPS does not deliver on weekends, and FedEx’s Saturday Delivery is not guaranteed and can pose some risk for running late). Orders with cold items will only be sent within the same week ordered so long as they will arrive by Friday afternoon, otherwise, please be aware that your order may be held to ship the following Monday in order to ensure optimal protection for your products. 4. If you will not be home at the time of normal delivery for your order (typically afternoons between 2 PM and 7 PM), we strongly suggest you have your order shipped to your work address, or, to a family member/friend/neighbor who can receive the items for you to put them in cold storage on delivery. We are not responsible for items delivered early afternoon and not received if you arrive home later in the evening when temperatures are warm in your area, so please ship appropriately to ensure your order will not be left out in the heat for hours after delivery which can rapidly increase thawing. 5. We do not recommend shipping to a PO Box address for any orders containing cold goods. Please ship all orders containing cold items to a physical address where you or a friend/family member/neighbor can receive the items at the time of delivery as orders sent to PO Box addresses cannot be replaced/refunded if there are delivery issues that delay arrival. Any PO Box orders containing cold items are sent at your own risk with no guarantees. 6. While cold items can ship outside the USA, they require expedited shipping options that may not be available at checkout. If you are outside the USA and wish to order cold goods, please email info@veganessentials.com for details on shipping options and costs prior to ordering. All orders sent outside the USA are sent at your own risk as we are not responsible for any delays in clearing Customs in the nation of delivery or issues that may prevent the items from being allowed in (please consult your nation’s Customs office for details on importing products and potential duty rates). 7. Please do not be alarmed if items arrive in a state of thawing so long as they arrive within the recommended 1-2 days from date of shipping with the cold shipper included. As there are no animal-based ingredients to spoil as things thaw, all products can be put back into proper cold storage on arrival to bring them to proper texture if they are no longer frozen. While most orders will arrive still partially frozen or well-chilled, areas with high heat tend to have orders thaw more rapidly on the 2nd day in transit, so be sure you’ve chosen the recommended shipping and all items will be fine as long as you get them into proper cold storage as soon as they arrive. 8. By clicking the checkbox to add this and any other cold items to your order, you confirm you have read our policies and have accepted all risk if you choose to remove the cold shipper or select shipping that takes longer than 1 or 2 business days for delivery. No refunds or replacements will be given on orders that ship without a cold shipper or where shipping is selected that takes more than 2 business days for delivery. From Anonymous of Saint Louis, Missouri on 3/6/2019 . 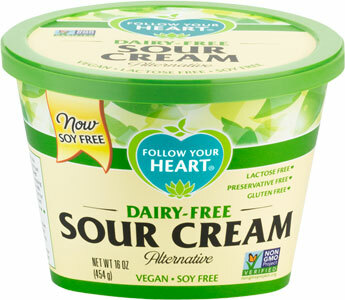 Been living the vegan gourmet sour cream by follow your heart for a long time. I bought this and didn't look closely. I assumed the packaging had just changed. Brought it home and ate it and it's terrible! I googled to see if the formula had changed. I discovered that the product I liked was actually discontinued and I'd been eating a new problem. There's a gross taste kind of like coconut oil to it. It permeates my Mexican food or anything i put it in. I've had to excessively spice the food to try covering it. Won't ever buy again. Bring back vegan gourmet! From Anonymous of Nc, North Carolina on 1/28/2019 . From Heidi Greger of Burnsville, Minnesota on 1/21/2019 . This tastes nothing like sour cream; it tastes like yogurt. I hate yogurt, so I will be dumping this out or giving to another vegan friend who might want it. Waste of money. Sad, because the reason I bought it was that it doesn't contain palm oil. We've been buying this for a little while now. It tastes much more like real sour cream than other brands we've tried. It's quite good, if you ask me!